It's "highly likely" that a police officer who was critically injured in a dramatic gunbattle with the Boston Marathon bombers was struck by friendly fire, a district attorney said Tuesday. 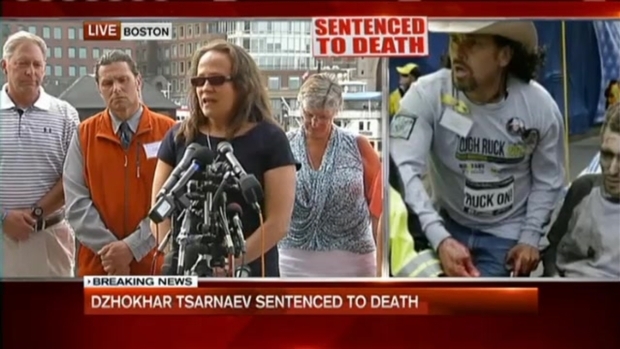 Middlesex District Attorney Marian Ryan, whose office has been investigating the gunfight between officers and Tamerlan and Dzhokhar Tsarnaev, said whatever wounded Massachusetts Bay Transportation Authority Officer Richard Donohue is still embedded in his leg, leaving investigators unable to confirm which gun fired the bullet. "We don't know what struck Officer Donohue because it has not been removed," she said at a news conference. 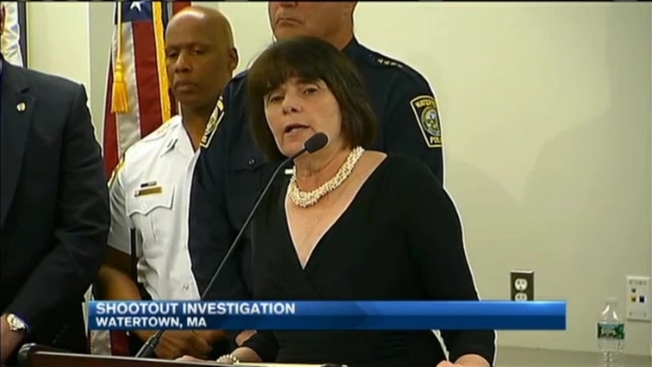 "It is likely that it came from the gun of one of the officers attempting to stop Dzhokhar Tsarnaev, yes." But Ryan said the shooting was justified because it was in "self-defense" of officers and people living in the dense residential neighborhoods where the gunfight took place on April 19, 2013. Survivors and relatives of victims in the Boston Marathon bombings shared their reaction to jury's decision. The bullet that struck Donohue severed a major artery, and he lost most of his blood and suffered nerve damage. He returned to work last month. Donohue said in a statement released by MBTA police that Ryan's report "does not take away from the heroic actions of those officers who ultimately prevented further acts of terror on the citizens of the United States." He said, "I harbor no regrets and am forever grateful to the police officers, firefighters, and medical professionals who saved my life on April 19th, 2013." Ryan's report follows one conducted by the Massachusetts Emergency Management Agency. That report found that some officers involved in the shooting showed a lack of "weapons discipline," resulting in dangerous crossfire. But it stopped short of saying Donohue was shot by fellow officers. The gunfight took place in the Boston suburb of Watertown four days after bombs exploded at the marathon finish line. The attack killed three people and injured over 260 others. One of the bombers, Tamerlan Tsarnaev, was killed amid the gunbattle. His younger brother, Dzhokhar, was eventually captured. He was sentenced last month to death.